Today: Partly cloudy. Warm. Highs 58-62. Tonight: Increasing clouds. Lows 41-45. Sunday: Cloudy with showers developing during the afternoon. Highs 49-53. Monday: Showers...possibly ending as a period of wet snow Monday night...especially across higher elevations. Highs 39-43. Tuesday: Clouds and any leftover sprinkles/snowflakes ending during the morning with peaks of sun during the afternoon. Highs 38-42. You won't be able to beat today's weather...high pressure sliding off the coast will lead to lots of sun and temperatures warming up close to 60 degrees (a good 15-20 degrees above average). A cold front will swing through Sunday AM and stall across the Carolinas. A few waves of low pressure will ride along this boundary bringing two separate precipitation chances...the first Sunday afternoon and then another on Monday. Wave #1 will be all rain but there may be enough cold air for a bit of wintry precipitation towards the end of wave # 2. Below is the 6z GFS-Parallel from early Saturday morning showing the setup. Don't get caught up in the specifics since we still have inconsistencies one run to the next...it's just easier to explain with images. Cold front swings through and the first wave develops along it bringing rain showers during the afternoon Sunday. Wave #1 works off the coast as wave #2 starts to shoot some precipitation towards the area. 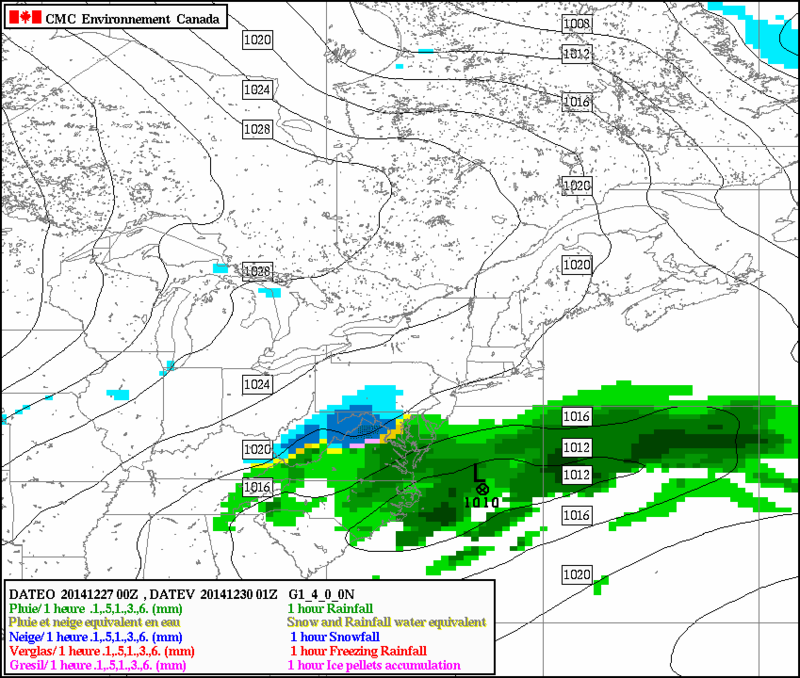 There could be a break in precipitation between the two Sunday night into Monday morning. Wave #2 eventually works off the Carolina coast...possibly throwing a bit of precipitation all the way northwest into our area Monday night when cold air is bit more established. In yesterday's blog I mentioned how it'd be hard for us to see snow because of how far west our cold air source is...my thoughts about that haven't changed. In the images above, you see our strong high pressure is all the way out in Alberta Sunday before dropping into Montana Monday. Cold air would be more available if this was centered further east across the upper midwest. So why am I now mentioning a period of snow possible Monday night? Well the model trend today has been for a more robust 2nd wave. This would mean precipitation ends early Tuesday morning as opposed to Monday afternoon giving cold air a bit more time to work in. This second wave will be key...the GFS above is actually the middle-ground model we have right now. The European keeps system # 2 very weak and quite south with precipitation confined towards the NC/VA border while the latest Canadian is much stronger and furthest north bringing accumulating snow to our area...shown below. Right now I'd say I'm leaning towards a Euro/GFS blend...with rain ending as a brief period of snow shower activity across higher elevations Monday night. We will have to see if the "stronger and further northwest with wave #2" trend continues today...certainly interesting enough to at least give a mention.